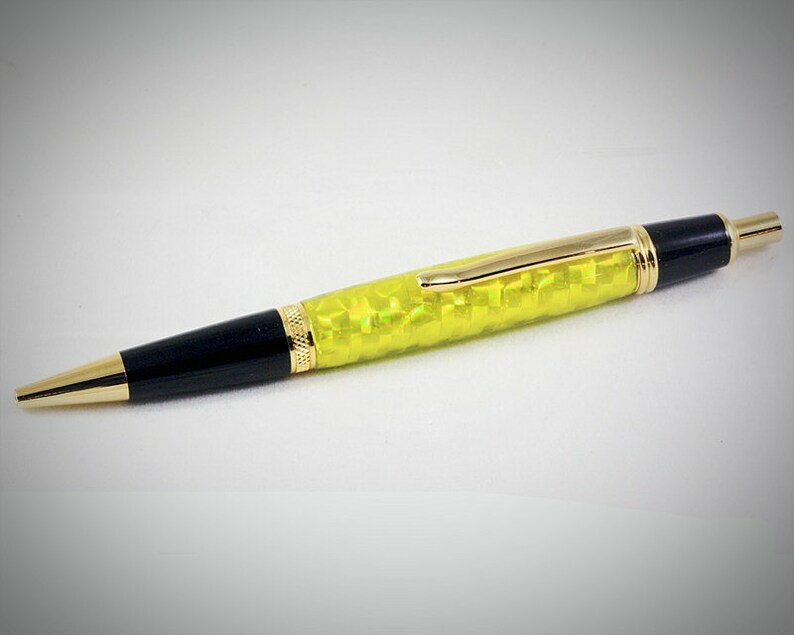 This yellow ballpoint pen was made by casting holographic tape in clear acrylic resin. When the light hits this designer pen it shimmers with a depth that produces a kaleidoscope effect. This high quality pen is one of the nicer handmade ink pens you will find. Pretty pens such as this are wonderful gifts for any occasion. Treat yourself or someone you know to this beautiful pen today! The cool pen that is pictured is the pen that the buyer will receive. Pen size: 5.75" long, .5" at it's widest point. First the pen blank was made by wrapping strips of holographic tape onto a brass tube. The tube was then cast in clear resin. The tape catches the light and sparkles, giving the pen a three dimensional appearance. Both ends of the cast tube were sanded flush to the brass tube. Then I mounted the pen blank onto a wood lathe. Using hand tools, I turned the blank down to it's final shape making certain that the ends of the blank were just the right size to match up to the components of the pen. I then sanded and polished the blank to an crystal clear finish. I then attached the components to the pen blank with a special press and a small drop of adhesive. Mike. Better yet, treat yourself to a quality pen from Ohio Penworks today.